Home BOLLYWOOD Photos: Katrina Kaif And Aditya Roy Kapur Couple Up For Fitoor Promotions! Photos: Katrina Kaif And Aditya Roy Kapur Couple Up For Fitoor Promotions! [tps_footer]Bollywood actors Aditya Roy Kapur and Katrina Kaif are starring opposite each other for the first time in an intense romantic love story, ‘Fitoor’. The duo is on their promotional tour for the film. Katrina and Aditya were snapped at the Mehboob Studios Bandra yesterday January 21, 2016. Katrina Kaif raised the glamour quotient in a stunning printed dress. She wore a cheery lemon-print Dolce & Gabbana mini, one that she wore with Charles & Keith slingbacks and Loupe earrings. Bright lips, slick hair and beige pumps rounder her look. 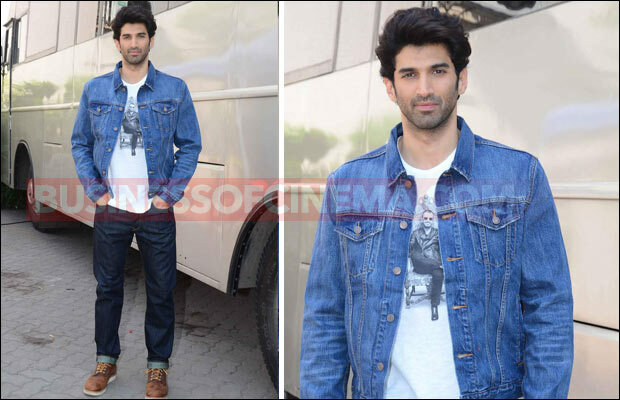 Aditya Roy Kapur looked handsome in a white T-shirt, denim jacket and jeans. The duo looked picture perfect as they posed for the shutterbugs. The film ‘Fitoor’ is an adaption from Charles Dickens’ thirteenth and the penultimate novel, ‘Great Expectations’. The movie features three pivotal characters namely Noor (Aditya), Firdaus (Katrina Kaif) and Begum (Tabu). The film is a romantic love story has twists of tragedy and sorrow in it as we saw from the trailer, and we’re loving the intense chemistry between Katrin Kaif and Aditya Roy Kapur. Next articleMy Saala Khadoos! Who Is Yours?